All of these terms were foreign to me when I started in real estate. I did not know anything about the real estate business. What I desired and would have died for was real estate success. And I have had success in real estate for the past thirty years. I was going to an electrical contractor school. And I would go to school from seven am to 11 am. Working in real estate, being in real estate sales, being a real estate listing agent or being a real estate buyer’s agent was the furthest thing in my mind. I got a job a real estate records company. And I got hooked on real estate as a profession for me. I met so many awesome people that were working in real estate. They have cash, they have investments, they have awesome homes and they have awesome lifestyles – freedom. If I can have success in real estate – you definitely can. Because I got in real estate by accident. You guys chose real estate as a career. What Is a Real Estate Listings? A real estate listings in the real estate agent or broker that represent the seller of real property. It is better to be a real estate listings agent; than to be a buyer’s agent. I was working with real estate investors. They were buying properties and loans across the country. And they were closing their office because they were retiring; they had made so much money. I was worried about how I was going to pay my rent. I instinctively knew I would have success in real estate. I just was not sure how I was going to do it. I was talking to my boss, and I asked him what my next move should be? He asked me, what do you think your next move should be? I told him that I wanted to get into real estate sales. He responded in a serious tone. If you are going to get into real estate sales; focus all of your efforts on working with real estate listings only. At the time I do not know why my real estate mentor told me to work with real estate listings only. I wanted to work with everyone on real estate. I wanted to work with real estate buyers, real estate leases, real estate business; I wanted to do it all. When I asked real estate listing broker how to get real estate listings. Everyone told me the same things: FSBO, Expired, Real Estate Geographical Farming. I was like ok.
At the time I did not know how to get real estate listings. I started to read and research the fastest way to get listings in real estate from motivated sellers. Let me fast forward a bit. I worked for a real estate records company, a real estate lender, a real estate bankruptcy attorney, and real estate investors. Then I went on my own. I started my own career as a real estate listing agent. Listing Generation System real estate success philosophy is for real estate sales agents that desire real estate success and real estate riches is to focus their efforts on working with motivated sellers, real estate listing. A real estate listing agents are the real estate sales professional that represents the seller of real property. What is a real estate selling agent? Listing Generation System, real estate success for real estate sales agents, newbie real estate listing agents, or veteran real estate listing agents to focus all of their efforts on working with real estate listings only. Listing Generation System coaches real estate sales agents to only be the selling agent to real estate transaction that the real estate transaction is going to go through, it is not going be a bidding war, and in which the real estate agent is going to be wasting his or her time being the selling broker. What is a listing Agent or sellers agent? 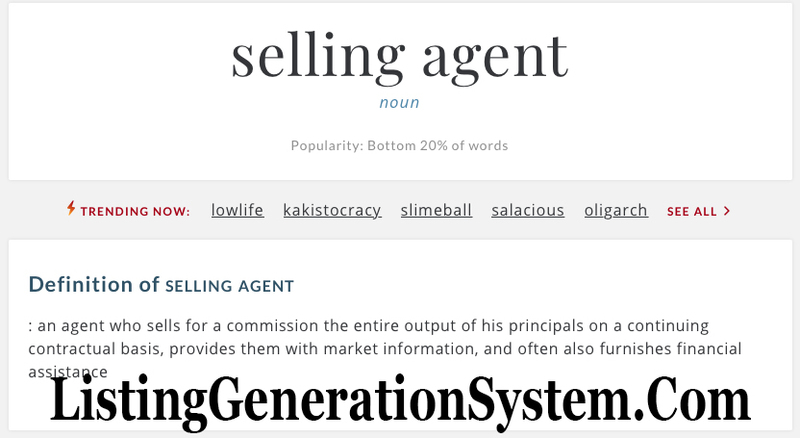 Listing Generation System real estate success philosophy to set their real estate business to represent motivated real estate sellers. What is the difference between a listing agent and a selling agent? Listing Generation System real estate success coaching to target their real estate business efforts to work with motivated seller leads. The likelihood of being paid a real estate listing commission are greater if the real estate sales agents focus their efforts on working with real estate motivated seller leads. Listing Generation System real estate success blueprint is for real estate sales agents to only present buyers they will be representing both sides of the transaction the buyers’ side and the listing side of the transaction. There is a lot of counter-intuitive activities in being a real estate buyers agent. My real estate mentor was a self-made real estate millionaire investor and he owned portfolios of properties including several properties across the country. He asked me if I knew who the listing agent was that represented him in the sale of all his properties. Agents are understood to lie about their own personal track documents. They have widespread advertising expertise in addition to relationships with different agents. A fantastic mortgage agent is going to be very happy to offer you an estimated record of compensation costs that you are in a position to show to potential buyers. Make your own assortment of items you want to go displayed in your house. Selling your property is something you’ll need to do perhaps only a few occasions in your lifetime. Purchasing a house is an important choice of your lifetime. If you end up listing your home with a realtor, you will expect a listing of potential buyers that looked in the property prior to the record date so they’ll be exempted out of the contract with your realtor. Generally, selling your home requires tons of abilities and a lot of patience. It’s likely to sell your house and save a huge number, but it needs work and dedication. You are selling your property. If you have to sell your home fast, the less versatility, you’ll be able to get. If you would like to get a new house, the ideal way to get a whole lot and avoid hassles involved with purchasing land appropriate to your budget and liking, would be to use the support of a realtor.